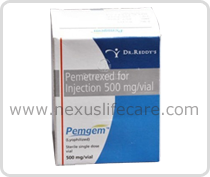 Uses :- Pemgem Injection, a folic acid analogue metabolic inhibitor, is prescribed as a combined therapy with Cisplatin for the treatment of non-squamous non-small cell lung cancer (NSCLC). As a monotherapy, Pemgem Injection is indicated as a post-chemotherapy cycle drug for the management of NSCLC. With Cisplatin, Pemgem Injection is prescribed for the treatment of mesothelioma.